Why you should get your decorative contact lenses from your optometrist only. Halloween is on our doorstep and we get many enquiries about decorative contact lenses.We are very strict about our patients having a consultation before purchasing the lenses. Many people do not understand why because they say ...” but it’s not prescription?? “Here is why we need to make sure that we follow the rules. 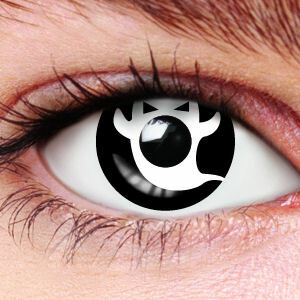 Did you know that these decorative contact lenses are actually medical devices? Just like regular contact lenses you should never buy contact lenses from a street vendor, a beauty supply store, flea market, novelty store or Halloween store—and you should always have a prescription. You can avoid some of these risks by getting any type of contact lenses from your eye care professional. Be sure to follow the directions for cleaning, disinfecting, and wearing the lenses that your eye care professional gives you. Do get an eye exam! A licensed eye care professional will examine your eyes to make sure the contact lenses fit properly. The fit of your contact lenses is very important. A wrong fit can cause damage to your eyes. Be sure to always go for follow-up eye exams. Do get a prescription! Your eye care professional will write you a prescription for all contact lenses, including decorative lenses. The prescription should include the brand name, correct lens measurements and expiration date. Do follow the contact lens care instructions! Follow the instructions for wearing, cleaning and disinfecting your contact lenses that come with your contact lenses. Do seek medical attention right away and remove your contact lenses if your eyes are red, have ongoing pain or discharge! Redness, pain and discharge from the eyes are signs of an eye infection. If you think you have an eye infection from your contact lenses, remove them and see an eye care specialist right away. Don't buy any contact lenses without a prescription! If you don't see a professional and get a prescription, then the contact lenses you get may not fit properly and may not work well. They could even damage your eyes. Sometimes wearing contact lenses can damage the top layer of your eyeball (cornea). Even if you aren't having any problems now, the lenses still could be causing damage to your eyes. By having regular check-ups and buying contact lenses with a prescription, you will reduce the chances of any undetected damage to your eyes. You can buy contact lenses, including decorative contact lenses, from an eye care specialist, on the Internet or from a mail-order company. It's very important that you only buy contact lenses from a company that sells FDA-cleared or approved contact lenses and requires you to provide a prescription. Anyone selling you contact lenses must get your prescription and verify it with your eye care professional. They should request not only the prescription, but the name of your eye care professional and their phone number. If they don't ask for this information they are breaking law and could be selling you illegal contact lenses.